We were on hand at Computex 2017 today for the Intel Core X series CPU and X299 platform launches. 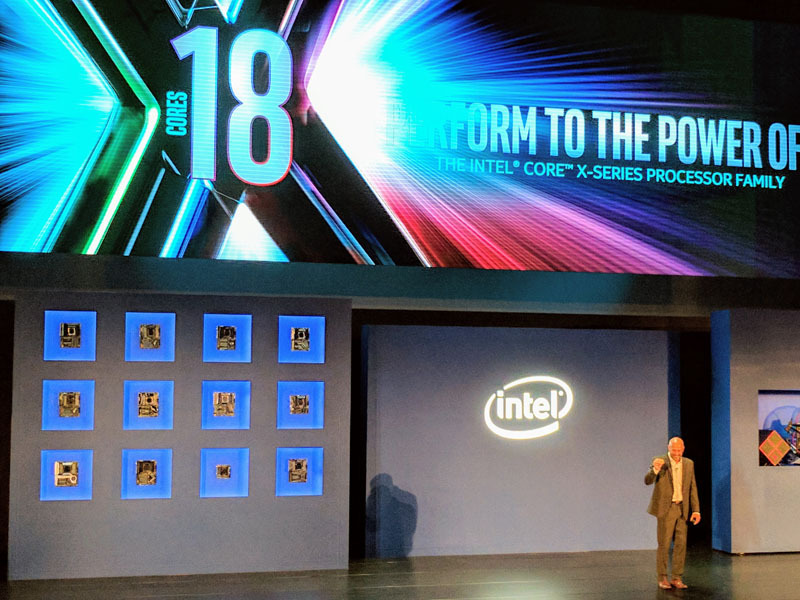 Along with these, we also saw the launch of a new Core i9 series CPU family. 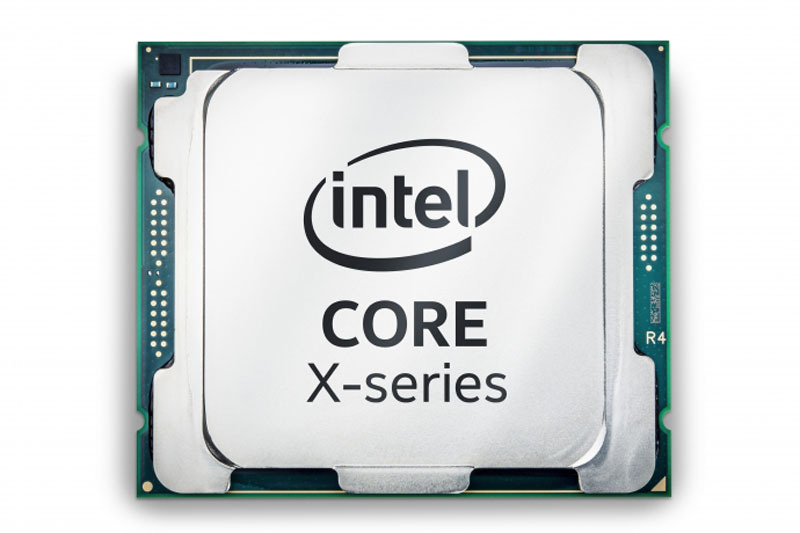 While the single socket core counts are a great improvement along with the clock speeds, Intel released its next-generation platform differentiation which is going to prove to be maddening for many users. We discussed this in our what to expect from Intel 2017 piece, but with the nine new SKUs there are at least four combinations of PCIe and memory configurations. 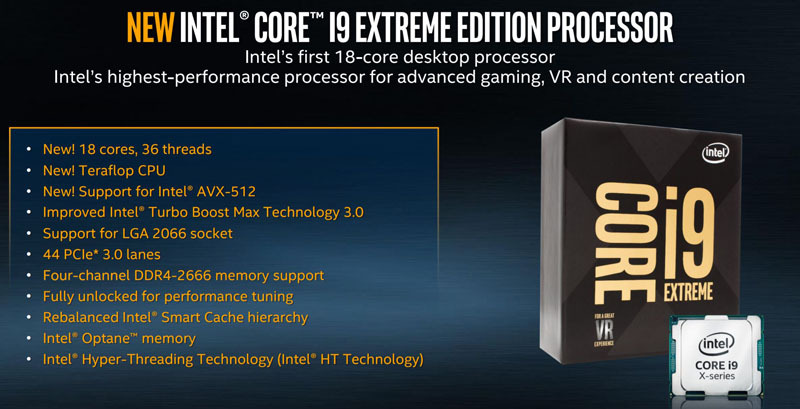 Before we get too deep into this, here are the nine SKUs that Intel is formally launching. 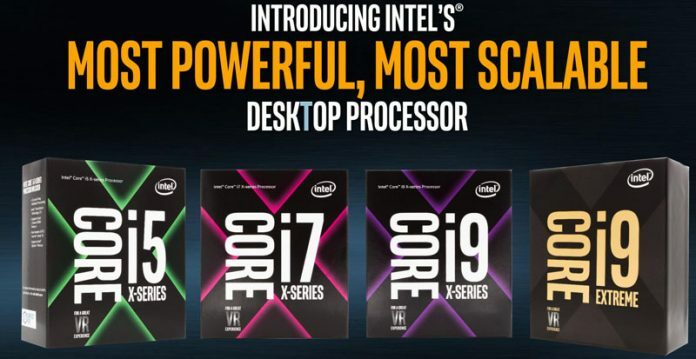 Note that Intel did not provide full details for its top SKUs. With AMD’s competing Threadripper platform expected to launch the following day, this is likely a competitive move. The mid-range to low-end of the series is clearly a competitive response to AMD Ryzen. The Intel Core i7-7820X is an AMD Ryzen 7 1800X killer given the fact that the Intel platform has more PCIe lanes and more memory bandwidth/ capacity all in the sub $600 market. We are likely to see many of the Ryzen 7 SKUs drop in price once these hit the market. 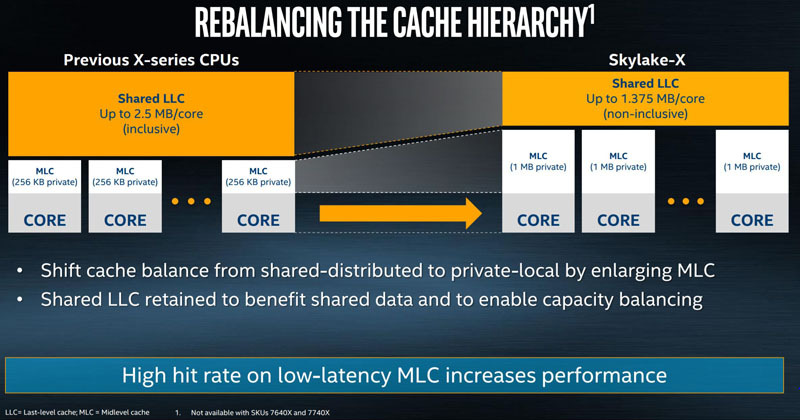 On the cache side, Skylake-X pushes more cache to the cores over being shared L3 cache. This is an architectural shift that we expect to see in other Skylake derivatives such as Skylake-SP. In terms of CPU architecture, this makes sense as Intel needs large caches to fill growing pipelines. 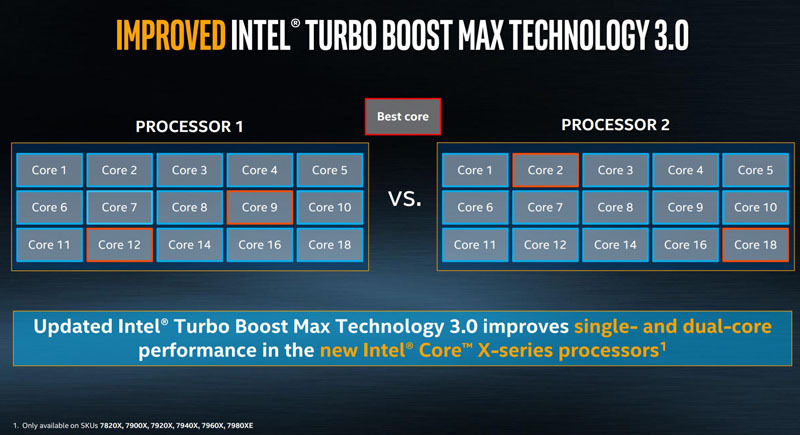 The L3 cache does take up a lot of die space so Intel needs to continually evolve how that die space is allocated. Of note, this is a feature only available on the Intel Core i7-7820X and up in the new SKU stack. Four of the nine models launched do not have this feature. If someone walked up to you on the street tomorrow and asked, “what machine learning CPU should I get?” What should your response be? For a single GPU system maybe the Core i7-7800X or Core i7-7820X are enough. For a multi-GPU system, you are likely better off getting two Intel Xeon E5 V3 CPUs (say E5-2630) than even a Core i9-7900X just to get more PCIe 3.0 x16 lanes. This is because Intel has decided to cull PCIe lanes of the Core i7 series. Even the outgoing higher-end Broadwell-E chips with 40 PCIe 3.0 lanes would be a better option than a Core X generation Core i7. Furthermore, one is required to use the LGA2066 platform even with the Core i5 SKUs that can only use dual channel memory and have 16x PCIe lanes. Instead of just stating four memory channels and 44 PCIe lanes, Intel now has four different PCIe/ RAM combinations with nine new SKUs. That is maddening. The Intel tax for requiring 32x PCIe 3.0 lanes for dual GPUs is approaching $950. You can get an Intel Xeon E5-2620 V4 and get 40 PCIe lanes for much less. We know the reason for this. Intel is actively trying to discourage inexpensive “light the platform” CPU purchases. For example, on paper one may think that the Intel Xeon E5-2603 and E5-2609 series (V1-V4) CPUs would rarely sell. In practice, they are popular in systems where you just need the least expensive CPU you can find to utilize the platform. Every GPU sale feeds one of Intel’s largest competitors, so Intel is finding a way to take back some of those marginal dollars. More concerning is that if you mirror PCIe 3.0 x4 NVMe drives or Optane drives, you are going to quickly start running out of PCIe lanes with the new platforms. This whole PCIe thing is a debacle. The PCI-e lane split is idiotic. It’s just giving me more reason to consider threadripper. 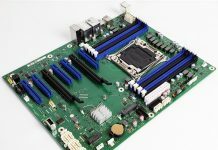 If customers just need a platform with as much PCIe lanes as possible and a cheap CPU to run it, why not an ARM system – that’s probably the cheapest solution of all. Or am I missing something? 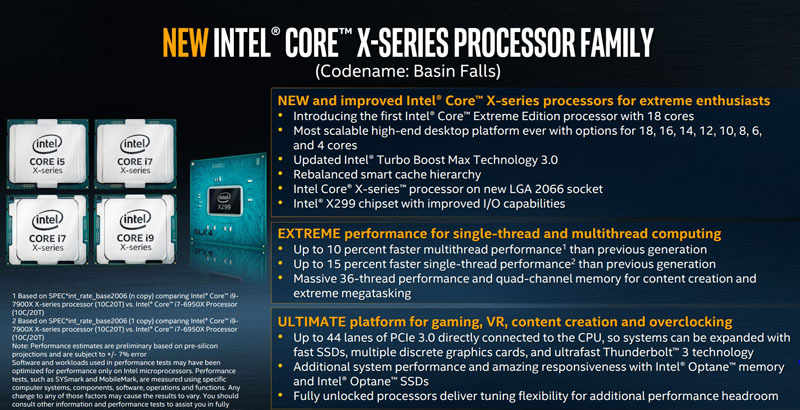 Is it confirmed that the Kaby Lake-X processors are using the 4+2 Kaby Lake-S die, but with the iGP lasered off? Or is that just speculation? What’s most offensive about this is the presence of what amount to repackaged LGA-1151 chips on LGA-2066. 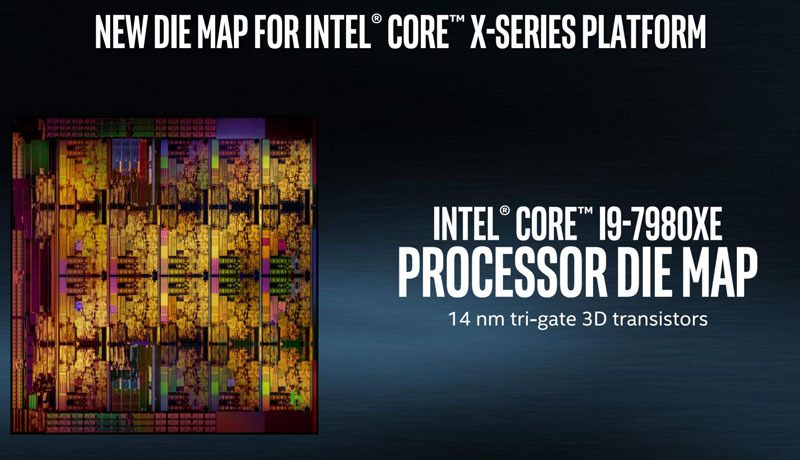 This *will* impact the Skylake-X chips, and not in a good way. Board makers *must* ensure compatibility with *all* CPUs. Last-gen, fine – 12 missing PCIe lanes is reasonably easy to work with. But this gen, they must ensure that CPUs with half the memory channels and a third the PCIe lanes will function on boards meant for HEDT chips. Completely asinine move on Intel’s part. Cheap is good to a certain extent. A majority of customers today are not going to abandon the Windows and x86 platform – x86 being more important than the Windows bit these days, but both are still important. AMD’s Threadripper with its 64 PCIe lanes from a single socket is a good alternative to grab as many PCIe lanes as possible while still staying within the walled garden of the x86 platform. That is harder with AMD’s architecture. They are using PCIe and memory controllers from each die to get the 128 PCIe / 8x memory channel configuration.